We are slowly settling in. We should be used to moving by now, but still, little things manage to crop up out of nowhere and throw one off balance. For instance: there are seventeen doors in our two-bedroom apartment, not counting the sliding doors to closets or the French windows opening on to the terrace. There are parts of the hallway in which you are surrounded by doors on all four sides. In a sense it is neat to be able to seal off parts of the house, but on some days I feel like I’m opening and closing doors all day in search of one little thing. A million little things like this and a puppy on top of that hasn’t made life any easier. All in all it took some time for me to sit down with my pencils again, unpacking them, taking stock of any damage in transit (none – they are all so sturdy!). I used to have a pencil pot holding my favorites and “to-try’s”, but this time I filled an additional out-of-service mug with what I think of as “friendly” school pencils, for studying Spanish. And this is when I came to see the Viking Skoleblyant 029 yellow pencil with a fresh eye. Readers will have noticed this pencil on Lexikaliker (who was good enough to send me one to try, along with the other Vikings). Gunther’s post gives you all the pertinent facts, including the history of the brand, which recently was brought back to its native Denmark by a firm called Creas. Bleistift gives a good overview as well. The history aside, it’s great to see a pencil that shows some thinking behind it, and which proves there are still some interesting things to be done with the yellow school pencil. 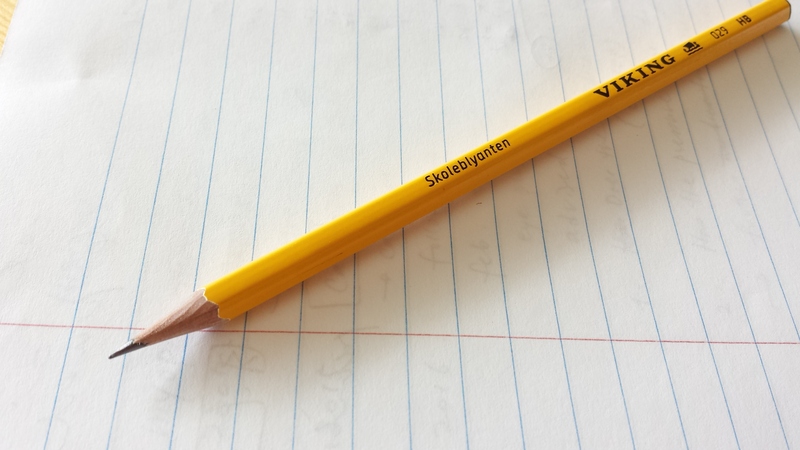 The color of the Skoleblyant (=school pencil), for starters, is a distinctive Scandinavian yellow that wouldn’t look out of place in an IKEA showroom. One of the reasons I like the lemon-yellow Caran d’Ache school pencil is because it is a shade lighter than the classic American ones, but even the CdA looks orangey next to the Skoleblyant. The coat is just thick enough to grip comfortably; the typography is neat, and the black-dipped pencil end is classy too. The lead is also very interesting. It is on the darker and softer side for an HB, more so than its siblings, the Element and Skjoldungen 400, but surprisingly it doesn’t crumble upon impact as such soft pencils tend to. When I first tried it there was a distinctly “rubbery” feel to it that reminded me of the “flexible lead” of vintage Eagle Verithin colored pencils; this sensation lessened with further sharpenings, but I still think the lead formula is somehow different. (The Viking homepage indeed uses the word “flexible” to describe the lead, but for the Element and not the Skoleblyant, which is mystifying.) Overall this is a very comfortable pencil, well made and distinctive, at an affordable price (around 50 cents per pencil I think – pencils like the Grip 2001, Wopex or Tradition sell for more in Korea). Among the post-Creas Viking offerings I tried, I liked the Skoleblyant 029 best; the Element came in a close second. Both are darker and softer than standard HB’s but the Element writes neater; the Skoleblyant is softer. The red Skjoldungen 400 (“office pencil”) was sort of nondescript, but it could very well hold its own against other office-grade pencils. All in all, a great find, and a brand definitely worth getting to know.